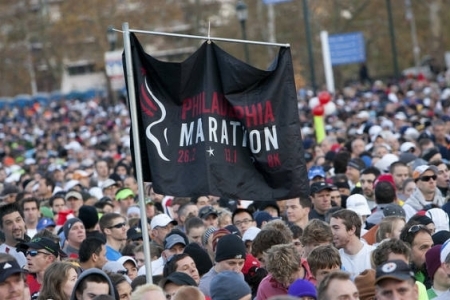 It was a beautiful day for the Philadelphia Marathon and Half Marathon their 28,500 participants. The sold-out race opened it's doors at the last minute to 1,454 runners from the cancelled New York City Marathon that was to occur just after Hurricane Sandy hit the area. Local runner Michael McKeeman of Ardmore won the 26.2 mile race in a time of 2 hours, 17 minutes, 47 seconds, behind the event record 2:16.47. Scott Macpherson of Austin Texas was second in 2:18.30. 29-year-old Irina Mashkantceva from Solikamsk, Russia won the women's title in a record time of 2:35.34. McKeeman, now 36 and winding down his racing career, ran the Philadelphia Marathon once before in 2006. He placed 2nd. This time he wanted to go out on top, taking the lead around mile 23 and finishing all alone. New Jersey Gov. Chris Christie made a surprise appearance on Saturday Night Live last night during the “Weekend Update” segment. This comes the day after ducking questions about Twinkies-baker Hostess shuttering bakeries to avoid giving comedians fodder saying he's on SNL enough. Christie thanked the Red Cross and first responders. He thanked his wife who put up with “a husband who has smelled like a wet fleece for the last three weeks.” He took a swipe at any New Jersey official who failed to comply with his orders before Sandy including “any of the stupid mayors” who ignored evacuation orders calling them “idiots.” He did not thank any of the reporters who walked out into middle of the hurricane, that's why we have windows. Christie also called on citizens to hold off on yelling at each other at gas stations until after the gas shortages. Monday, Mainly Sunny, High 52 in Philadelphia.